"Cubbie" redirects here. For the pastoral lease, see Cubbie Station. Wyre, viewed from Cubbie Roo's Castle, with the ruined chapel and burial ground visible. Wyre is one of the Orkney Islands, lying south-east of Rousay. It is 311 hectares (1.20 sq mi) and 32 metres (105 ft) at its highest point. It is one of the smallest inhabited islands in the archipelago. Orkney Ferries sail from the island to Tingwall on the Orkney Mainland, Egilsay and Rousay. Wyre's history is still very apparent, and it has two ancient monuments maintained by Historic Scotland, Cubbie Roo's Castle and St Mary's Chapel. The poet Edwin Muir (1887–1959), known for his prominent part in the Scottish Renaissance, born in Deerness on Mainland, Orkney , spent much of his childhood on Wyre. In his autobiography he said of himself - "I'm an Orkneyman, a good Scandinavian", and commented that some of his happiest childhood years were spent here. Cubbie Roo's Castle, built about 1150, is one of the oldest castles in Scotland and was mentioned in the Orkneyinga Saga. It takes its name from Kolbein Hruga who was said to have lived there. In King Haakon's saga, it is mentioned that after the last Norse Earl of Orkney, Earl John, was murdered in Thurso, his killers fled to Wyre. They took refuge in the castle, which was so strong that the besiegers had to thrash out a deal with them to get them out. In the centre of the island is the roofless, but largely complete, twelfth-century St Mary's Chapel. Its architecture is Romanesque and demonstrates that the Norsemen, best known for their Viking raids, also had a cosmopolitan cultural influence. It has been partly restored. Like most of Orkney, Wyre is made up of Old Red Sandstone of the Devonian period. The island is low lying, and is shaped like an isosceles triangle on its side. It is generally low lying, and is separated from Rousay by Wyre Sound. 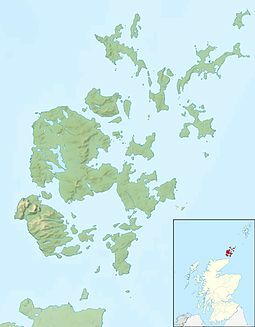 Rousay is to the north, Gairsay to the south, Mainland to the south west and Shapinsay to the south east. Bu ties with Ae in Dumfries and Galloway as being Britain's shortest name for a settlement. Wyre is also known for its grey and common seals, and for birdlife including divers and ducks. ^ Anderson, Joseph (ed.) (1873) The Orkneyinga Saga. Translated by Jón A. Hjaltalin & Gilbert Goudie. Edinburgh. Edmonston and Douglas. The Internet Archive. Retrieved 26 August 2013. ^ a b c d e f g Haswell-Smith, Hamish (2004). The Scottish Islands. Edinburgh: Canongate. ^ Guinness Book of Records 1985. Guinness Books. p. 91. Wikimedia Commons has media related to Wyre. This page was last edited on 7 September 2018, at 12:57 (UTC).